2018 National Original Print Exhibition. 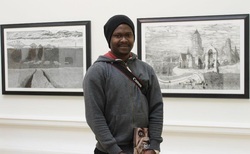 The Royal Society of Painter-Printmakers Prize. A year's membership to the RE. London. 2018 Royal Academy of Art, London Original Print Fair Prize, London. 2018 Royal Academy of Art, Summer Exhibition, London. 2018 40/40 Vision, 40 Years of Wasps Artist Studios. Kirkcudbright Galleries. Group Exhibition. 2018 Society of Scottish Artists/Visual Arts Scotland Open Exhibitions. Open Eye Gallery Award. 2017 National Original Print Exhibition, Bankside Gallery, London. ​2017 Artist in Residency, Wasps Artist Studios, Admiral's House, Lower Ollach, Isle of Skye. Scotland. 2017 Micro MACRO. The Newly Elected Royal Glasgow Institute of The Fine Arts, Kelly Gallery, Glasgow. 2017 Royal Scottish Academy, Summer Exhibition, Edinburgh. 2016 Artist in Residence, Eton College. Eton, 2016. 2016 Just Before the Light, The Gallery Tweeddale Museum. Peebles. 2016 8th International Printmaking Biennial of Douro 2016, Portugal. 2016 Aberdeen Visual Artist and Craft Makers Award. 2015 Artist in Residence, Highland Print Studio, Inverness. 2015-2016. 2015 Royal Scottish Academy Open Exhibition, Wasps Residency Award. 2015 The Biscuit Factory, Newcastle. 2015 National Original Print Exhibition. London. 2015 National Original Print. Hawthorn Printmaking Supplies Award. 2015 Tribuna Graphic 2015. Romania. 2015 The 2ND Global Print 2015. Portugal. 2015 Royal Academy of Art, Summer Exhibition. London. 2014 Royal Academy of Arts, Summer Exhibition. London. 2013 Linocut Today 2013, Stadtische Galerie, Bietigheim Bissingem, Germany. 2013 The Aberdeen Artists Society, Wellhead Electrical Supplies Prize. 2012 Artist in Residence, Gray's School of Art.